This AP headline spread like fire across the internet. 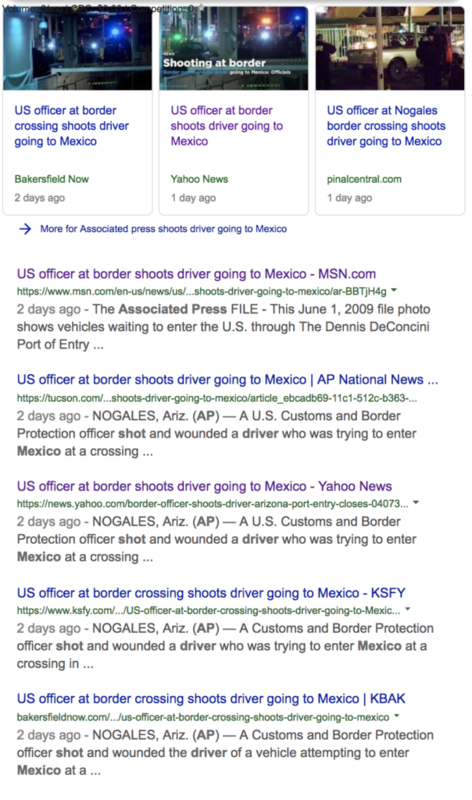 It makes it sound like the officer wrongly shot an innocent driver on his or her way to Mexico. There are countless more news reports with this exact headline. It is a war zone! The US is constantly invaded by ILLEGAL aliens who commit horrible crimes against Americans on a daily basis but the liberal, mainstream media doesn’t want to report that. Have you seen the caravans?! The lib media only wants to mention the residents and shopkeepers who complain about border security. It is a war zone, and we finally have a president who is willing to protect the US from ILLEGAL ALIENS and all the criminal activity they bring.